GREEN YO’SELF FOR FOOD DAY! Cozy up to your favorite fruit or veggie. Apply Foodstand’s green filter to #GreenYoSelf! This Saturday, October 24th is Food Day—an initiative to inspire good eating and improve food policies. One of Food Day’s goals is to promote a greener diet—and we totally dig that, so we need your help to spread the word! In celebration, we want to call upon all Foodstanders to show how you eat green! 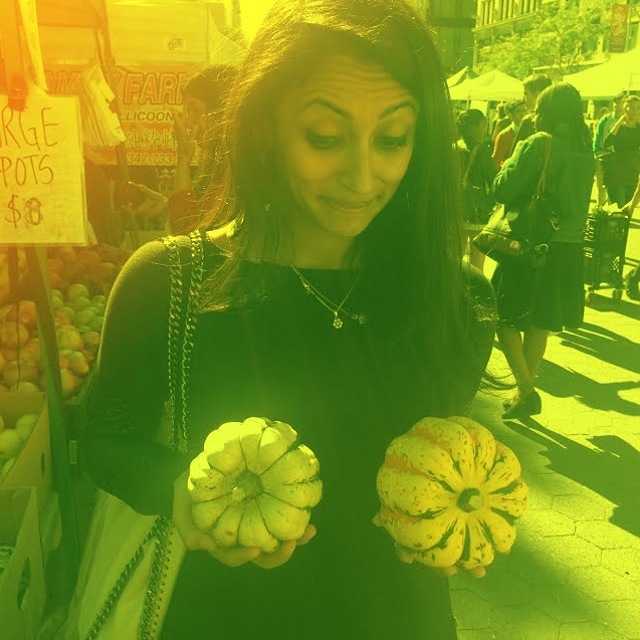 Snap a selfie with your favorite fruit or veggie and apply the Foodstand app’s green filter to #GreenYoSelf. You’ll be entered to win a green (obviously) Cuisinart Smart Stick and help celebrate Food Day by getting closer to the source of your food and joining with others on Foodstand! What makes for a greener diet? Brussels sprouts, broccoli and kale certainly qualify. But eating green can take many forms. Michael Pollan’s ubiquitous statement, “Eat food. Not too much. Mostly plants.” is a great place to start. And plants don’t have to be green— plants of all colors (e.g., beets) help work toward a greener diet. How about eliminating processed foods? Potato chips fortified with Vitamin A might sound like a great excuse to chow down on your favorite crunchy snack, but it’s best to get Vitamin A from a real food source, like sweet potatoes or winter squash. So make sweet potato chips in your oven, instead! There are a lot of lurkers in processed foods, like unnecessary sugars, fats and chemicals. Carefully reading ingredient labels and eliminating the foods that have these guys hiding inside will do wonders for working toward a greener diet. Oh, and if you haven’t noticed, the Foodstand app is now available for all iPhone users (no invite code needed)! If you haven’t already, download it here and invite your friends to do the same! Spread the good food word! Perfect timing with Food Day, eh? We think so. 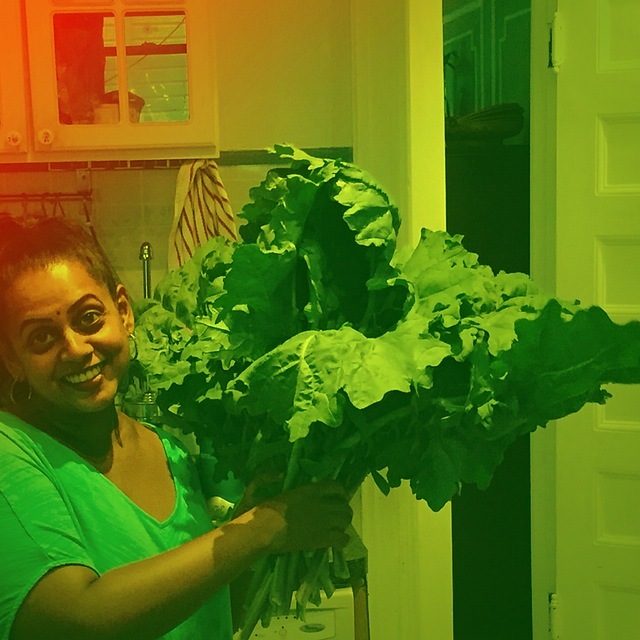 Introducing kale into your diet like Foodstander @AMK with her huge harvest is an awesome way to bulk up a meal with vitamins and nutrients. Want a recipe? Kale Coconut Fried Rice from @cravingsinamsterdam is a green eating variation of the traditional dish that will leave you drooling. To make the coconut rice, place the rice, coconut milk, boiling water and salt in a medium saucepan. Start on medium heat until it starts to boil. Give it a good stir. Then reduce the heat to low, cover and let it simmer for about 15 minutes, until the liquid is absorbed. Remove from the heat. In a large bowl, mix the coconut rice with 4 cups of shredded kale. In small bowl, mix the sriracha, lime juice and soy sauce. Set aside. Slice the tofu about the same size as fish sticks. Pat the tofu dry with paper towels. Mix the cornmeal, some salt, pepper and lemon pepper on a plate. Coat the tofu pieces in this mixture. In a large pan, melt 2 tablespoons of coconut oil. Over medium-high heat, pan fry the tofu until it is golden and crispy on both sides. Set aside. Melt 1 tablespoon of coconut oil in a large pan. Over high heat, stir fry the baby paksoy. Season with salt, then remove from the pan and set aside. Add 2 tablespoons of coconut oil to the same pan. Over medium-high heat, add the ginger, garlic, spring onion and radish. Stir fry for 1 minute and then add the coconut rice mixed with kale. Stir fry for about 2 minutes and then add the sauce. Stir fry for another minute. Then remove from the heat. Divide the rice between 3 plates. 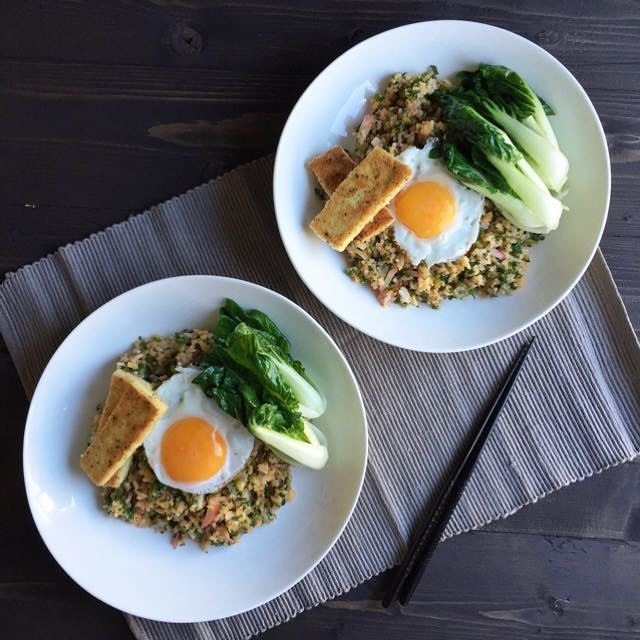 Serve with 2 baby paksoi, a fried egg and some of the crispy tofu. Not just a great bra, squash also makes delicious fries! 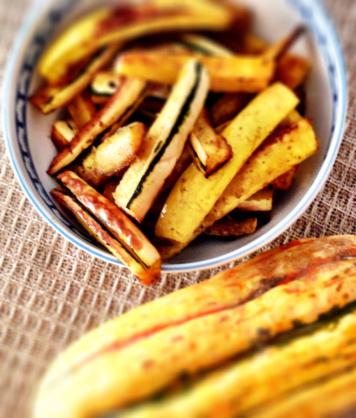 So ditch the prepackaged potato chips and follow Foodstander @simplywithout‘s lead by trying her Squash Fry recipe! With only squash, olive oil and spices, you’ll rest assured there aren’t any nasty hidden ingredients in your afternoon snack. Generous amount of the following: salt, pepper, garlic, onion powder, and… Old Bay! Pre heat the oven to 400 degrees. Slice the squash in half, lengthwise. Remove the seeds, save to roast or compost. Slice again in half, lengthwise. Cut in half, across. Adjust the size to the fry slices you desire. Place in a large mixing bowl. Add all other ingredients and work with your hands to cover each piece, think squash massage. Place on a baking tray and bake for about 25-30 minutes, checking and shake about half way. Serve in a bowl and enjoy!